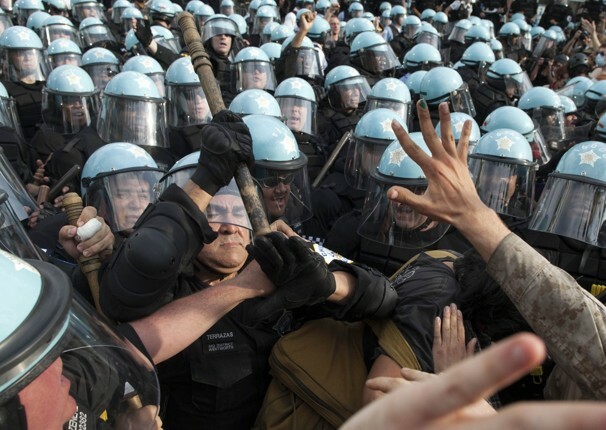 Now that the NATO Summit has swept out of my city, the local press can’t stop fawning over the performance of the Chicago police – and gloating over how silly and meaningless the mass demonstrations turned out to be in the end. Mission accomplished. With all of the focus on the Chicago streets, I guess we were successfully distracted from the truly meaningless demonstration that was the NATO Summit. As for me, I’m in full agreement with Stephen Walt, who has correctly pointed out that this massive, fancy, expensive, city-paralyzing event was little more than a “fig-leaf” for NATO – a pageant designed to put a happy face on an Afghanistan war that is hugely unpopular and has suffered from ever-changing objectives from the very beginning. And please don’t be fooled by the explanation that NATO will be ending “combat operations” by 2014. Officials have openly stated that these post-2014 “non-combat” troops will continue to launch “anti-terror” raids – which is simply just another way of saying they will continue to do what they’ve been doing all along. The gated communities – like the one in which Trayvon Martin was killed – have been erected on a global scale to protect those fleeing the mayhem wrought by our economic and military policies. This was exemplified last March when a boat with 72 African refugees fled the NATO-led war in Libya. When the boat found itself stranded it sent out a distress signal that was passed on to NATO which had “declared the region a military zone under its control”, and then promptly ignored it, as did an Italian ship. The boat bobbed around in the Mediterranean for two weeks. All but nine on board were left to die from starvation, thirst or in storms, including two babies. This entry was posted in Politics, Terrorism, War, World on May 23, 2012 by Rabbi Brant Rosen. I’m old enough to remember “Vietnamization” — which I can’t stop thinking about every time I hear a news story about security being “turned over” to the puppet government of South Vietnam, perhaps two years before the US fled in abject defeat. Thank you for your continued enlightenment and commitment. “massive, fancy, expensive, city-paralyzing event”….for those of us who have followed your posts on low-wage workers at downtown hotels, we should actually have more of those types of massive events so there is more need for employment at downtown hotels, and with more need for workers, wages should go up. Can NATO come back soon? An excellent article which has certainly enlightened me on the whole nato process and the protesters who were there to protest this.much more has to be exposed on a most pressing issue facing our Country. I wondered about who benefits from the circus. The people of Chicago, who expect to use the highways were denied them either entirely (LSD near downtown) or on demand (Kennedy) so that the motorcades of the 1% could pass freely from O’hare to downtown. Would this conference have taken place without Rahm in the mayor’s office? NATO is a good example of how large organizations just go on and on long after the reason they were created has been forgotten. I think of it as a military employment agency and handy political cover for the U.S. to make unilateral moves look like the wish of many countries – in that sense it still serves a purpose for administrations that shows no end in sight. Could this possibly become a guest editorial or op-ed piece for the Tribune?